Five Battery Indicator Lights: The five battery indicator among the solar panel owns residual quantity indicator function to real-time display the remaining battery power. When the power bank is under charging, the green indicator will on. On the contrary, the blue indicator will on when the power bank is working. 1.Long press the button beside, the light will turn on. 2.Continue to shortly press the button, it will enter into SOS mode, the light would keep flashing in the dark. Next short press will turn off the light. 1.Please charge it with its original authentic adapter and charge line until completely full power at the first time use, which can activate the battery capacity. 2.Do not hit, strip or try to repair the item. 3.Please keep the item and the USB ports clean, which can prevent the item damaged from short circuit. 4.Please charge the power bank once a month if you don't use it often, which can prolong its service life; please ensure 50% of electricity storage if you don't use it for a long time. 30 days of refunds or returns without any reason and 1 year Manufacturer's Warranty. Welcome to contact us by email auseins@hotmail.com. 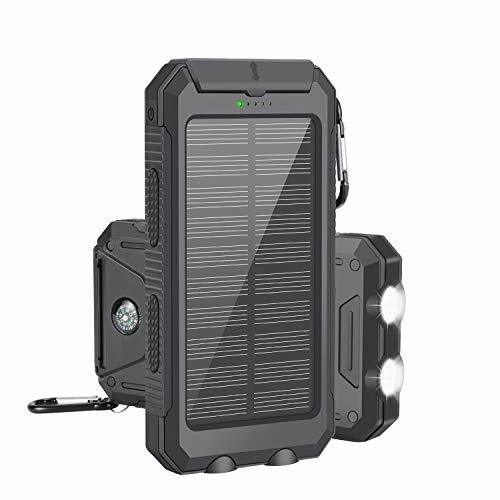 SUPER CAPACITY BATTERY&SOLAR CHARGER: Equipped with 10000mAh of battery capacity and solar panel, the power bank can continuously discharge and recharge itself via sunlight. Keeping you away from the trouble of power-off. DUAL USB PORTS: 5V/1A, 5V/2.1A(Max) USB ports provides you more choices, making it easier to charge two devices at the same time. Support Charging for most digital equipment like cellphones, cameras& More. COMPASS AND 2 LED LIGHTS: The built-in Compass can help you find directions in the wild and 2 Ultra-Bright LED lights can be used as a flashlight with Steady-SOS-Strobe modes. WATERPROOF AND PORTABLE DESIGN: Made of ABS+PC+Silicone, the power bank's surface has excellent heat dissipation and special granulated design. The rectangular backup bars ahead the ports can effectively block the water from soaking in. Portable styling design making it a perfect choice for outdoor activities. KINDLY REMINDER: The solar feature can just be used as "an emergency back-up", for it would take a long time to fully charge the power bank. We sincerely suggest you to charge it by adapter and charge line before starting the journey. Any more questions, please feel free to contact our customer service. If you have any questions about this product by AUSEINS, contact us by completing and submitting the form below. If you are looking for a specif part number, please include it with your message.